The teeth lose more support as the gums, bone, and periodontal ligament continue to be destroyed. 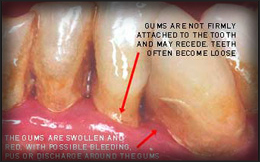 Unless treated, the affected teeth will become very loose and may be lost. Generally, moderate to severe bone loss may be present.